The configuration also contains pointers to the module icon and the language file containing labels like the module title and description, for building the module menu and for the display of information in the About Modules module (found in the main help menu in the top bar). The LLL: prefix is mandatory here and is there for historical reasons. When modules are registered, they get added to a global array called $GLOBALS['TBE_MODULES']. It contains the list of all registered modules, their configuration and the configuration of any existing navigation component (the components which may be loaded into the navigation frame). $GLOBALS['TBE_MODULES'] can be explored using the SYSTEM > Configuration module. 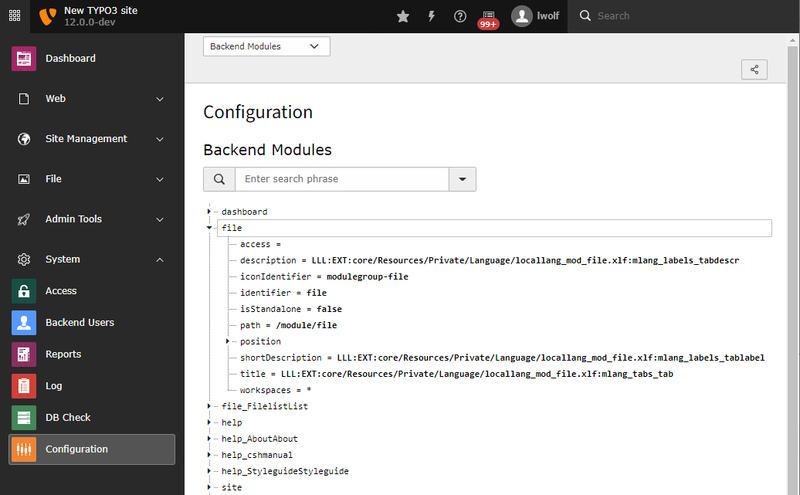 The list of modules is parsed by the class \TYPO3\CMS\Backend\Module\ModuleLoader.